It’s finally here! The turkey is eaten, the shopping is underway, and the tree is ready to be decorated. It’s Christmastime once again, and I couldn’t be happier. It’s a time when the joy of giving, the peace of a winter’s night, and the beauty found in simple moments with people you love aren’t just cliches. The holiday season is my favorite time of year, and it’s my hope that I can share some of the happiness I feel during this time with all of the people in my life—including all of you that read NGN. As I get ready for my first viewing of one of my favorite Christmas movies tonight, I want to share with you my list of 10 must-see Christmas films and holiday specials. These aren’t necessarily the best or the most popular, but they’re my personal favorites—the movies I come back to every year when I want to get into the holiday spirit. 2.) 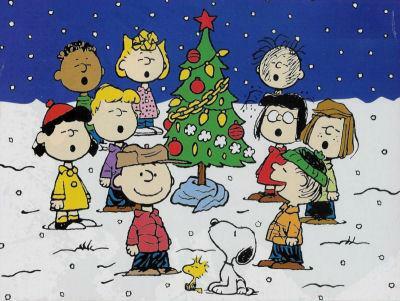 A Charlie Brown Christmas: No Christmas is complete without this classic. From the music and the sad little Christmas tree to Linus’s poignant reading of the Christmas story, this is one of those movies that forever shaped the way we experience Christmas in America; everyone has fond memories of this heartwarming special, and I’m certainly no different. 3.) 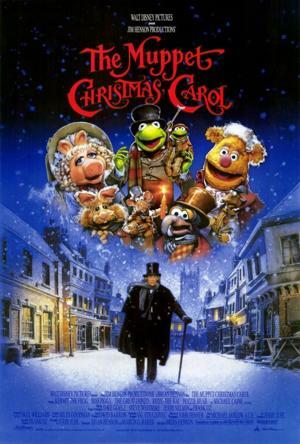 The Muppet Christmas Carol: My favorite retelling of Dickens’s A Christmas Carol is this funny, charming, and surprisingly heartfelt version from the Jim Henson Company. “One More Sleep ‘Til Christmas,” “Bless Us All,” and “When Love Is Gone” are three standout musical numbers from what is one of my favorite Christmas-movie soundtracks. 4.) 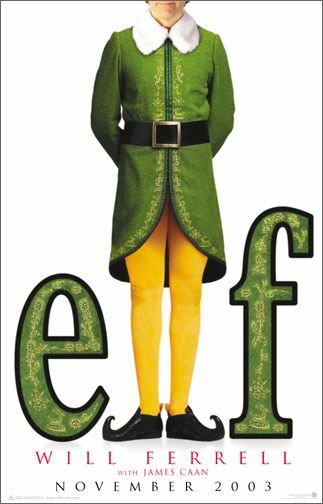 Elf: This post’s namesake is one of the most enjoyable Christmas movies to come out in the last decade. My friends, family, and I can be found quoting this truly fantastic family film year-round (“You sit on a throne of lies!”). 5.) 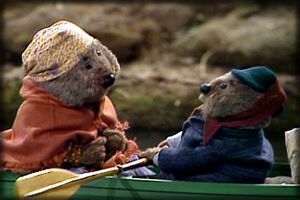 Emmet Otter’s Jug-Band Christmas: This movie always makes me reach for the tissues, and I wouldn’t have it any other way. The mixture of adorable puppets, great music, and a genuinely affecting story makes this another memorable Jim Henson contribution to my list of Christmas favorites. 6.) 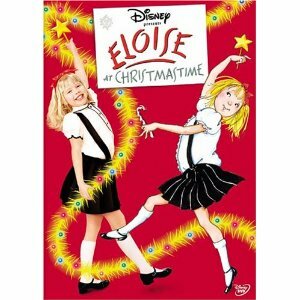 Eloise at Christmastime: The beauty of New York City during the holidays and the charm of a surprisingly engaging love story make this a must-watch for me every year (my first viewing of it was this morning, actually). And who doesn’t love a good Julie Andrews movie around Christmas? 7.) 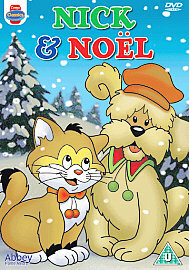 Nick and Noel: It’s not a great cinematic achievement by any stretch of the imagination, but this made-for-TV movie from 1993 makes me feel once again like the 5-year-old girl who made her parents run around searching for this movie after she put it at the top of her Christmas list. It may be as cheesy as they come, but it’s also a Christmas tradition I’ll never let go of. 9.) 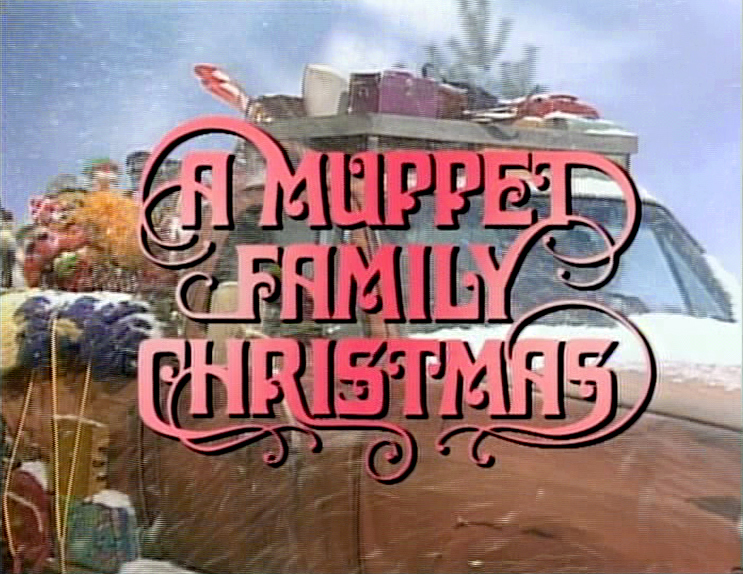 A Muppet Family Christmas: Is there anything better than all of the Muppets (including the Fraggles and Sesame Street gang) gathering together for Christmas hijinks and one epic sing-along? I really don’t think so. 10.) It’s a Wonderful Life: This is my favorite Christmas movie, one I watch with my family every Christmas Eve and watch alone at least once beforehand (so I can cry without anyone judging me). With a beautiful love story at its center and a wonderful message about what makes a person’s life worthwhile, there’s no movie that better captures the spirit of the Christmas season. These are my favorites, but now I want to know yours. I’m always in the mood to watch new Christmas movies, so I’d love to hear your recommendations. And from this nerdy girl to all of you, may your holiday season be filled with light and love. This entry was posted in Film, Television and tagged film, holiday happenings, lists, television by Katie. Bookmark the permalink. We really do share a lot of the same favorites 🙂 Love Actually, Muppet Christmas Carol, and Elf are pretty much my top 3, because I can’t get enough of dancing Hugh Grant, Rizzo and Gonzo as narrators (“Light the lamp not the rat! Light the lamp not the rat!”), or Buddy the Elf jumping on a Christmas tree. Love love love. One year during the Christmas season, Regis and Kelly did a week of shows from Disney World, and my family happened to be there one weekend (making it pretty much your average weekend, since I live nearby). They weren’t filming at the time, so we walked right past the set and the first thing I noticed was that it was definitely, definitely the rooftop where Big Bird waits on Christmas Eve. I may or may not have been a little starstruck in the presence of that roof. I’m also a huge sucker for Home Alone. A good rendition of Carol of the Bells never fails me. Secondly, I am so jealous of your close proximity to Disney World! It’s my favorite place on Earth. I’ll be back there in June, and I’m counting down the days already! Ahh so fun! Actually now I’m kind of jealous–I go over for dinner, the hotels, and the pools a lot but haven’t been into the parks in over a year and a half, thanks to my year in Alaska with JVC. I’m home now but planning to move out of FL as soon as possible, so buying seasonal passes didn’t make a whole lot of sense. I’m having such Disney separation anxiety! You might make it to the parks before I do. I completely agree with your #1 choice! Love Actually is one of my favorite movies and it’s one I always have to watch at Christmastime (and usually during the rest of the year as well). There are so many talented people in the movie and I love all the different story lines. Hugh Grant as Prime Minister is fantastic and always puts a smile on my face, although I think Liam Neeson’s story with his stepson may be my favorite. Muppet Christmas Carol is Sam’s favorite Christmas movie and I think we’re finally going to watch it together for the first time this year since I’ve never seen it. 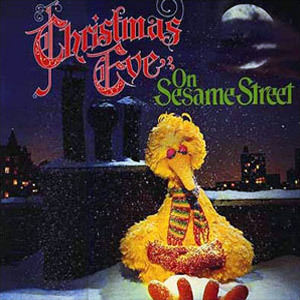 I’d never heard of Christmas Eve on Sesame Street until this post, but I think I may have to go watch it now! Rudolph the Red-Nosed Reindeer is probably my 2nd favorite Christmas movie. I love the music and it’s such a nostalgic movie for me that I make sure to watch it at least once during the Christmas season. I also really like The Santa Clause although I don’t love it as much now that I’m older as I did when I was little. 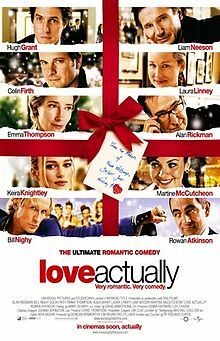 Love Actually was the first movie I had to watch as soon as the official holiday season began on Friday. It just makes me so happy. It’s like a warm mug of tea and a blanket on a winter night. Are these ranked or are they just a list? Because if they are ranked, I take issue with A Muppet Family Christmas being #9. That would be just inhumane. Ooh, there’s a few of these that I haven’t seen so I’ll have to check them out! I’ve always been meaning to watch Elf and I keep forgetting, so that’s at the top of my list right now (if I can find somewhere to watch it from lol). I need to watch Love, Actually again (and someday I need to watch it with you!) and see what I think of it on the second (or third?) go-round. I definitely enjoyed it the first time but I don’t think I loved it quite as much as I was expecting to, so maybe it’ll grow on me ;p I haven’t seen Christmas Eve on Sesame Street for years but I remember loving it as a kid, so maybe I’ll have to see if it’s airing sometime in the next week! Also I think I’ve seen It’s A Wonderful Life but I think I might have only seen part of it as I caught it mid-airing on TV, so I’ll have to find it sometime as it’s definitely a classic. A Charlie Brown Christmas is pretty much always on my list, and I also usually watch How The Grinch Stole Christmas, the original version (because it’s a classic!). I also sometimes watch Frosty the Snowman and Rudolph the Red-Nosed Reindeer if I happen to catch it on TV, because childhood nostalgia hits me hard this time of year lol. I might also watch The Holiday (with Kate Winslet & Cameron Diaz) because it’s cute and has some holiday-related things going on. We definitely need to watch Love Actually together someday! And you should totally watch It’s a Wonderful Life all the way through sometime because it has such a beautiful message. I actually have never seen The Holiday, which is so crazy because I LOVE Kate Winslet so much. Maybe I’ll try to rectify that before Christmas! OK stop whatever you are doing right now and sit down and watch The Holiday. Do not report back until you have done so. That is all. Charlie Brown Christmas — Linus meaning of Christmas is one of the singular most poignant Christmas moments ever and Schroeder’s exchange about Jingle Bells with Lucy makes me laugh every single time. 35 years and it never gets old. How the Grinch Stole Christmas — Boris Karloff and Cindy Lou Who is mere perfection for me. It is my childhood memories wrapped up in 22 minutes. The live action is an abomination to me. Santa Claus is Coming to Town — I adore this cartoon with the Meister Berger and the Winter Warlock. One Foot in Front of the Other makes me happy like few songs on the planet. Meet Me in St. Louis — Aside from the fact that it has my favorite Christmas Carol in “Have Yourself a Merry Little Christmas” I simply love this musical. I only watch it at Christmastime so for me it’s a Christmas movie. Sound of Music — I realize this is not a Christmas movie per se but it is the movie my family watched as a family every Christmas. Back in the day it was an annual event when it came on because Cable didn’t exist and VHS/DVD had not yet come along. So you only got to watch it once a year which made it special. It was one of the few things my brother sister and I always watched together (along with Wizard of Oz at Thanksgiving). 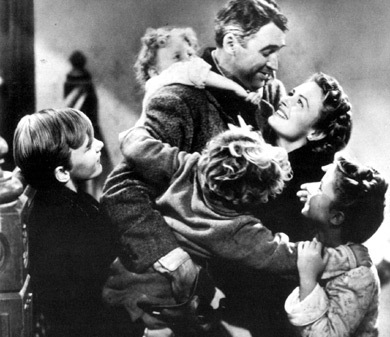 It’s A Wonderful Life — I don’t love the whole movie, but I love what it has come to represent. And as an adult it has become a tradition for me for wrapping presents. Adds to the level of gratitude for the season. The Holiday — I adore this movie in a cheesy, sappy feeling kind of way. Kate Winslet is a delight and it was the first time I have ever liked Jack Black in anything. His sequence in the trip to the DVD store will make you laugh out loud and his later scene writing Arthur’s scene will make you love him best, which is saying something when the other male lead is Jude Law. I LOVE this list. And I completely agree about Linus’s scene about the meaning of Christmas being absolutely beautiful. My mom has an ornament with the dialogue from that scene, and I love to just listen to it whenever I need that little reminder. I also concur with your Grinch feelings—the live action version completely destroyed the meaning of the original story to the point where it shouldn’t even be called the same thing. And once again, I need to go watch The Holiday asap (when I’m done with Orphan Black, of course! ).